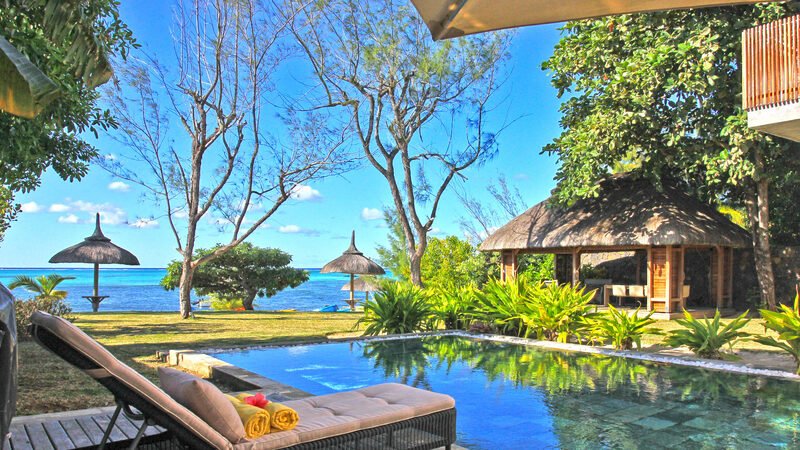 Villa Kavanga, on the North-Eastern coast of Mauritius, is part of a domain composed of 8 villas. Kavanga is a beach front property with unobstructed views of the Roches Noires lagoon from the 2 private terraces overlooking beautiful enclosed garden with exotic plants and lush lawns. The luxury villa is set against a majestic backdrop: a formation of black rocks makes an enclave to the sandy beach overlooking the Indian Ocean. This setting, in such an exceptional location, simply blends luxury with privilege. In front of the villa the wide lagoon, with its various islets nearby, provides a sheltered zone for various types of marine activities. Not far from the three acclaimed golf courses of the Eastern Coast, the village of Roches Noires is only 15 kilometres away from Grand Baie, the “Northern Riviera” known for its luxury shops, restaurants, clubs and marina. The world-renowned Pamplemousses Garden is less than a half-hour drive from your residence and you can reach the city of Port Louis in less than one hour. 4 bedrooms / 3 bedrooms with double beds / 1 bedroom with twin beds / 5 bathrooms. Master bedroom, 1st floor, view of the sea. Bathroom ensuite, with 2 washbasins, bathtub, walk-in shower. WC in the bathroom. This bedroom includes also air conditioning, sofa, living area, TV, DVD player, safe, dressing room. Room, 1st floor, view of the garden. Bathroom ensuite, with 2 washbasins, walk-in shower. WC in the bathroom. This bedroom includes also air conditioning, TV. Room, Ground level, direct access to the pool, direct access to the terrace, view of the garden, view of the sea. Bathroom ensuite, with walk-in shower. WC in the bathroom. This bedroom includes also air conditioning, office table, TV. Room, Ground level, view of the garden. Bathroom ensuite, with shower. WC in the bathroom. This bedroom includes also air conditioning. Villa Kavanga features quality furniture, air conditioning, Plasma TV with satellite (2 bedrooms connected), a high quality furnished dining area and Teak furnished kitchen with granite kitchen top, a private swimming pool, covered terrace and balcony, iPod docking station, dishwasher, fridge freezer, iron and ironing board, oven, combo washing and dryer machine, microwave. Please note: 2 Maids works 9am to 1pm except Sundays and Holidays. Overtime: 5€ per extra hour. A truly exceptional property with fantastic immediate location on beach and excellent staff. La propreté et la modernité de la maison. L’agent de sécurité qui rassure la nuit. La propreté de la piscine, un passage par semaine n’est pas suffisant en cas de vent. La quatrième chambre qui n’est pas une vraie chambre. C’est limite de l’arnaque lorsque l’on regarde les photos des chambres sur votre site. Merci pour ces commentaires. Nous précisons bien dans notre descriptif que la 4eme chambre est plus petite que les autres. Elle dispose malgré tout d'un lit double et d'une salle de bain privative avec douche et WC. Concernant la piscine : Effectivement en période de pluie et de vents, la chimie de la piscine se détériore. Nous avons néanmoins mis en place une maintenance 2 fois par semaines pour assurer la satisfaction des clients sur cette très belle propriéte pieds dans l'eau sur l'une des plus belle plage de l'ile. Maison de standing , pisicine et jardin très agréable , avec l'océan indien au fond du jardin. Cadre exceptionnel! Plage calme, authentique et préservée. Voiture cependant indispensable . Un grand merci à Isabelle et sa collègue ( les employés qui venaient tous les jours) pour leur extrême gentillesse et pour leur cuisine excellente . Elles ont contribué à nous faire passer un très bon séjour. Norbert à été en dessous de tout nous ne l'avons jamais vue sauf au départ c'est mon épouse qui l'a reçu il était pressé il avait des clients dans le sud. Il nous à fait aucune proposition en extra sauf par internet. Depuis la prise en charge exclusive par Villanovo de cette villa, l'accueil est maintenant assuré par nous directement et nous assurons un service de haut standing personnalisé. la villa correspond parfaitement au descriptif, villa très agréable et fonctionnelle, plage magnifique devant avec quasiment personne. Tranquillité, repos, plongée exceptionnelle dans le lagon juste devant la maison. Un grand merci à Evane de Villanovo qui a su me guider et me conseiller sur le choix de la maison, elle a su cibler mes attentes et me proposer un bien qui nous correspondait totalement. Assez isolée, pas de petit restaurant à proximité, voiture indispensable. Overall a very good villa that we would recommend. The only downsides we found in this villa were the tvs. There wasn't one in the downstairs communal area and the one in the downstairs bedroom wasn't working. Also parts of the villa need a paint touch up where suitcases had caught the walls. Thank you for the comments on the shortcomings. The TV upstairs and downstairs have full access to Canal+ and other premium channels as well as high speed internet. We regularly paint the house to ensure it meets international luxury standards. Il manque une chaine HIFI.